Beginning as a small town on the banks of the Potomac, the neighborhoods of Foggy Bottom and the West End grew into the capital's industrial center at the head of the Chesapeake and Ohio Canal, with factories, gasworks and breweries. The amalgam of working-class row homes, stately mansions and mills largely disappeared with the coming of the twentieth century, and in their place came the federal government, George Washington University, the Kennedy Center and the Watergate. 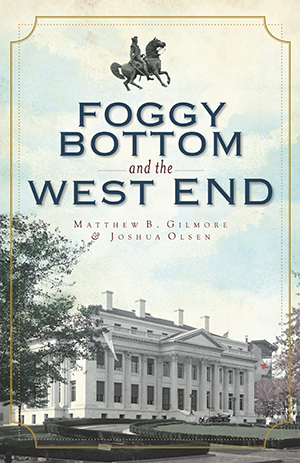 With a collection of rare vintage images, local authors Matthew Gilmore and Joshua Olsen have compiled a stunning visual narrative of the evolution of these historic Washington, D.C. communities. Matthew Gilmore has authored a number of books: Historic Photos of Washington, D.C. (with Andrew Brodie Smith), Historic Photos of Arlington County and Historic Photos of Franklin Delano Roosevelt. He is the founding editor of H-DC, the Washington, D.C. history discussion list and website (http://www.h-net.org/~dclist) and has published in, guest co-edited for and serves on the editorial board of Washington History, the journal of the Historical Society of Washington, D.C. Josh Olsen is the author of Better Places, Better Lives: A Biography of James Rouse, which chronicles the rise of one of America's great city shapers. Josh is currently in charge of acquisitions for a real estate development company in Washington, D.C. He is a graduate of Yale University.